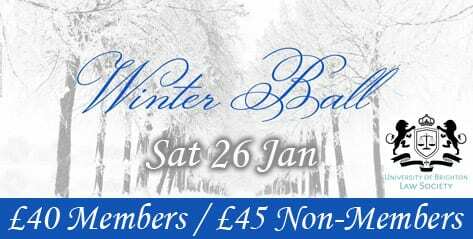 Brighton Law Society Winter Ball – ticket sales close on Friday! Law students! Where will you be on Saturday 26th January at 7pm? At the Law Society Winter Ball at the Grand Hotel, of course! Don’t miss one of the best Law Soc events of the year! Ticket sales close on Friday 18th Jan. It’s a great networking opportunity as well as a chance to let your hair down and forget about studies and deadlines for a while. Get your tickets here for only £40 if you’re a member of the Law Society and £45 if you’re not. This includes a three-course meal. One last thing – don’t forget to nominate one (or more) of your Law tutors for a Learning & Teaching Award! Anonymous nominations can be made here and must be done by 19th January. You can also nominate other Business School tutors as well as professional/support staff (scroll down the page to find the relevant section for each type of nomination).